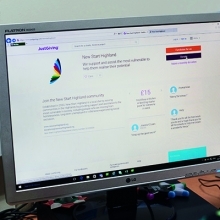 Donating to New Start Highland couldn’t be easier. We can accept most things that help make a house a home and we’ll collect your items for free! 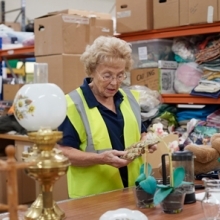 Please note we can only take items which are in a fit condition to be sold or refurbished. Here is our suggestion list – if you’ve got something to donate that’s not here, it may still be useful, so phone us to discuss and to arrange a collection. 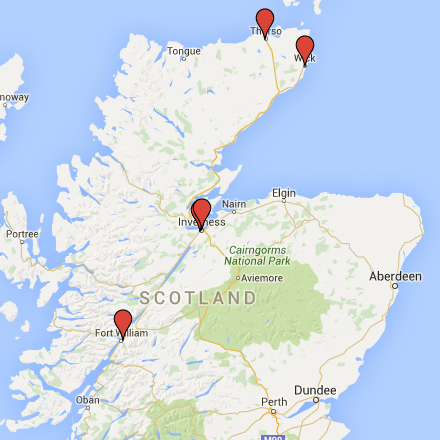 Call 01463 715615 for Inverness and Lochaber, or 01847 890696 for Caithness and Sutherland. Kitchen: pots, pans, crockery, utensils, dining tables and chairs. Living Room: sofas*, chairs*, coffee tables, pictures and frames, carpeting (only new carpet), solid wood units, curtains*. Bedroom: beds, mattresses*, chests of drawers, dressing tables, bedside tables, wardrobes, bedding and towels. Electrical items (small appliances): vacuum cleaners, fires, heaters, grills, steam cookers, (sorry, but we can’t accept gas appliances). *We can only accept upholstered items if the original fire retardant label is attached. Fire labels are permanent and will be sewn into or stapled on to any external surface of the item, including underneath removable seating or cushions. With poverty levels and fuel costs rising in the Highlands, a cash donation can help us support more people in the Highlands who are experiencing crisis. Your donations of household items are always invaluable, but we can’t always rely on the number of cookers, duvets or heaters needed to deliver hot food and warmth to everyone who needs them. Cash donations help us fill in the gaps, so that if our warehouses run low on essentials, nobody needs to go without. Please click on the button to donate using our JustGiving page. please use our JustGiving account. If you’re a UK taxpayer, you can Gift Aid the donations you make to New Start Highland. This means we gain an added value of 25%, at no extra cost to you. We gain this through claiming back the tax you have paid on your donation (25p for every £1 you donate). This additional income can make a huge difference to us, so please don't forget to fill in the Gift Aid Form when you donate to us, or when your donations get picked up. If you’d like to find out more about fundraising on behalf of New Start Highland, please contact us for support. On behalf of everyone at New Start Highland, and the families we support, we thank you for any donation you choose to give, your support is vital! We aim to make donating to New Start Highland as easy as possible, so we can come and collect your donation free of charge! Simply phone 01463 715615 for Inverness, or 01847 890696 for Caithness and Sutherland, and you can arrange your collection with our logistics team. You can also drop off items at several Recycling Centres throughout the Highlands, however please note: We are unable to accept electrical appliances at Recycling Centres. 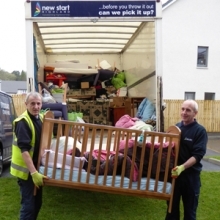 If you would like to donate anything electrical to New Start Highland, please arrange a collection or drop off at a New Start Highland Warehouse.